WHAT MAKES OUR PIZZA’S SO SPECIAL? Crisply baked crust that DOES NOT SAG or become SOGGY from our state of the art infra red ovens! Our Special Pizza Square sauce has an incredible unique taste. Appeals to both adults and children! A fresh blend of real cheese that provides a creamy smooth flavor that melts beautifully! Our delicious peperroni: Mild but flavorful pepperoni that enhances the pizza experience! mozzarella, aged provolone, and white cheddar. (Sure we can do almost any topping, some of the favorites are; Italian Sausage, Onions, Mushrooms, Bell Peppers, Black Olives, Canadian Bacon, Pineapple, Jalapenos, and Anchovies). (For that special occasion; yes! made to order). Your choice of a protein based sandwich, energy bar, fruit (fresh or dried), cookie, a bag of chips and either a bottled water or juice box. (Oven fresh chocolate chunk, oatmeal, raisin or sugar). 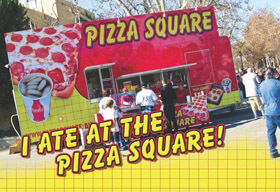 The Pizza Square Trailer is not available in all areas. Price and conditions are subject to change and you will be notified as soon as possible.